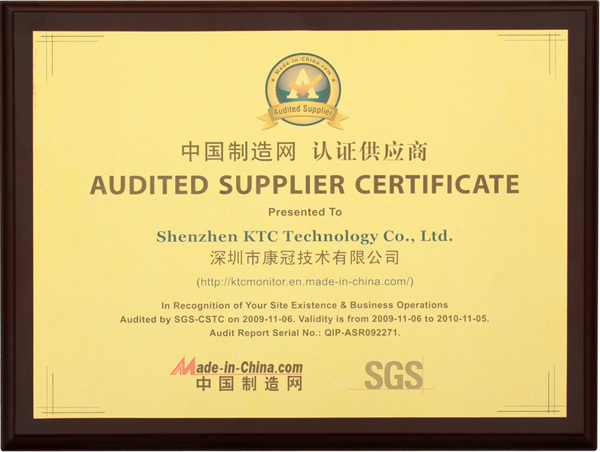 Our company was, on November 6, 2009, certified as a “Certified Supplier” in a certification service hosted jointly by Made-in-China.com and Switzerland SGS Group, one of the three leading certification companies in the world. The certification (certification No. : QIP-ASR092271) is valid from November 6, 2009 until November 5, 2010. To get “Certified Supplier”, Chinese suppliers shall undergo on-the-spot certification by SGS as a third-party authoritative organization, and then SGS independently carries out the review and completes the report with a unique SGS serial number, which provides authoritative qualification certification for Chinese suppliers. The on-the-spot certification reflects the basic conditions of enterprises such as their production and operation conditions, personnel size, and management process. Purchasers can have a full knowledge of suppliers’ characteristics through the certification reports so as to identify the suppliers that best fit their actual need.